Baby, it’s hot outside! Do you ever have customers complain about a second floor in their house that just does not seem to ever get cool? 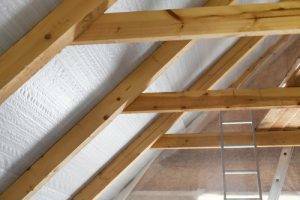 As a result of this summer’s extreme heat, a large number of homeowners in Massachusetts are moving forward with the decision to install spray foam insulation in their attics in order to beat the heat, according to a recent Yahoo! Finance article. As you may already be aware, spray foam insulation is an alternative to traditional building insulation materials – think fiberglass or cellulose – where a mixture is sprayed onto a surface to form a foam that stays in place as it sticks to the surface after expanding. According to the article, many homeowners quickly realize the advantages of spray foam as soon as the very next day, following installation. Occupant safety, among other things. If you want to avoid having any of your spray foam projects fall behind due to extreme summer heat – often a time when spray foam equipment can break down – check out our new e-book. This e-book features a wealth of information, including the many of advantages of working with a spray foam equipment provider who can answer your call within one business day.